In 2017, a bill that would have allowed licenses to illegal immigrants was filed in the lower chamber by Democratic Assemblyman Francisco Moya, but the legislation died in the state Senate, which was controlled by the Republicans at the time. New York State Comptroller Scott Stringer is an advocate for the measure. 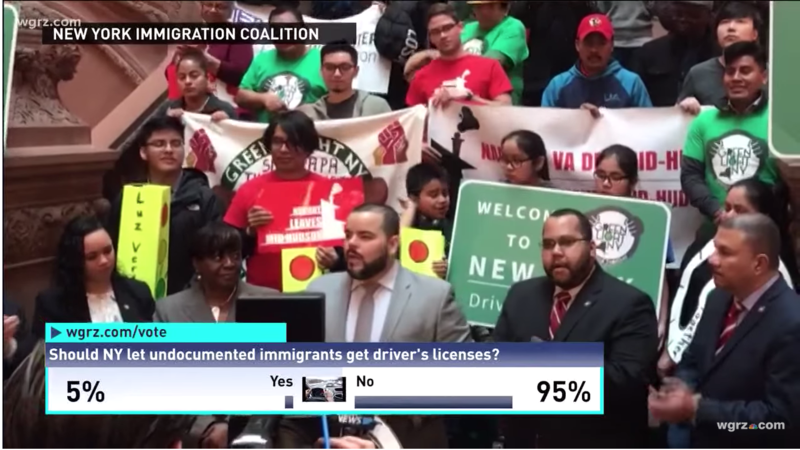 “For many of us, a driver’s license is nothing more than a piece of plastic tucked in between our credit cards, but for undocumented immigrants it means better job opportunities, a safe way to get your child to school, and to the hospital in an emergency – all without fear of deportation during a routine traffic stop,” Stringer said at a rally with Fiscal Policy Institute (FPI) officials in Manhattan last month, according to The New York Post. The new Siena poll, however, shows a majority of New York State voters don’t like the leftward direction the New York State is going in, either. Just 36 percent say that the Empire State is not moving too far to the political left, while 51 percent says the state is moving too politically leftward. This Siena College Poll was conducted between March 10-14 by telephone calls conducted in English to 700 New York State registered voters. It has an overall margin of error of +4.2 percentage points. For many American's...awarding illegal aliens a Driver's License, which is a privilege to Drive in this country, not a right, is a REWARDING and aiding abetting illegal aliens to live and work in this country which they have NO right to do so. It is a Government issued license and in direct violation of our Federal Immigration & Visa Laws and should be a Felony for any State to issue foreign citizens a Drivers License! SIGN AN EXECUTIVE ORDER TO DEEM ALL GOVERNMENT ISSUED DRIVER'S LICENSES TO ILLEGAL ALIENS NULL & VOID AND THEY SHOULD NOT BE RECOGNIZED BY ANY LAW ENFORCEMENT OFFICER, IN ANY STATE IN THIS NATION, AS A VALID I.D.! THAT IS FRAUD!!! APPREHEND THEM, HAND THEM OVER TO I.C.E. AND PUT THEIR VEHICLES IN A COMPOUND TO BE SOLD AT AUCTION! DO NOT REWARD...DEPORT THEM ALL.